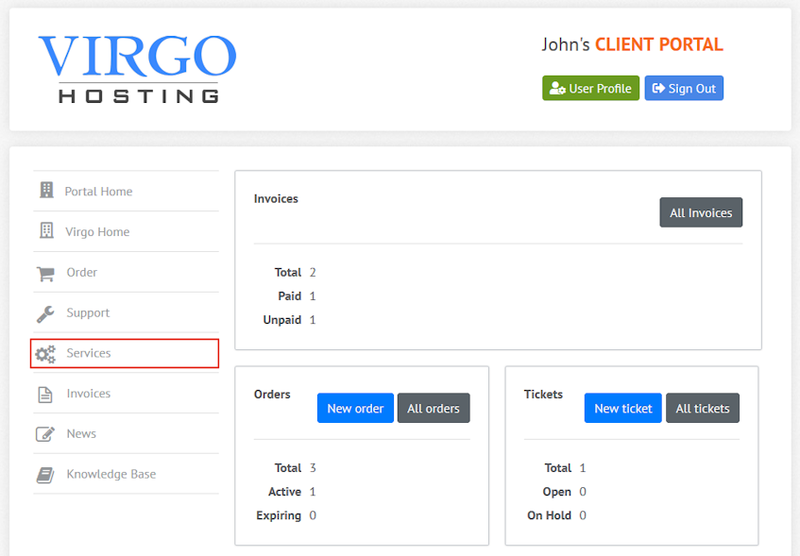 The Services interface in the Virgo Hosting Client Portal lets you view and manage your orders. In the client portal homepage, click 'Services' button in the menu. If you're accessing the client portal from a mobile device, the menu will be accessible through the 'MENU'icon. The orders table in the client portal services interface lists your orders and allows you to manage them. "Service" column of the orders table shows the name of your order. "Price" column of the orders table shows the price and term of your order. "Next due date" column of the orders table shows the oncoming due date of your order. "Status" column of the orders table shows the current status of your order. Find the order you'd like to view the details of and click the service's name in the "Service" column. A new page will open. "Order" column of the service details table shows the order id of your service. "Service name" column of the service details table shows the name of your service. "Payment amount" column of the service details table shows the price of your service. "Billing cycle" column of the service details table shows the billing period of your service. "Order status" column of the service details table shows the current status of your service. "Order created" column of the service details table shows the date the order for your service was created. "Activated at" column of the service details table shows the date your service was activated. "Renewal date" column of the service details table shows the date your service will be renewed, if it's active. Click "Renew Now" button to create a new invoice for renewal of the service. You will next pay for the invoice in the "Invoices" interface. Click "Request Upgrade" button to submit an upgrade request ticket. This option is visible only if there's an upgrade option available. Click "Open Ticket" button to submit a new support ticket related to this service. Click "Back to services" link to go back to the services homepage.